The Whaler Resort has two 12-story condominium towers and is located on Kaanapali Beach! Kaanapali Beach is consistently rated the best Beach in Hawaii! Fantastic location! This ground floor unit has been completely remodeled with a walk in shower and beautifully furnished. 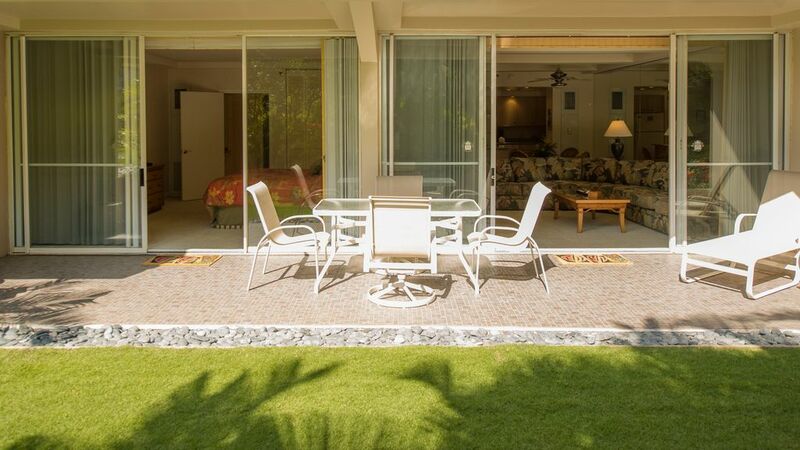 The tropical landscaped gardens and lawns bring Maui into your condo. There is a king bed (new 2013) in the master bedroom with new bedding, a custom murphy queen bed in the living room (real mattress). New window coverings, new patio furniture and granite. NO PETS allowed of any kind or you will be evicted! The complex is located next to Whalers Village ( We are in Tower 1 which is not the tower next to the Village) which is an upscale shopping village with over 50 stores, bars and restaurants. . A short stroll down the beach walk and you can enjoy the shops and restaurants of the Hyatt, Sheraton, Marriott, or the Westin Hotels. Right across the street are the two Kaanapali Championship Golf Courses. If being able to walk out your door and be at the beach or golf course while staying at one of the premier condominium properties on Maui appeals to you, reserve your stay with us now you won't be disappointed! I was a flight attendant for Northwest Airlines 22 years and traveled all over the world. Maui is still my favorite vacation spot and winter home because it is clean, safe, and in the United States. Most people will not go back to Mexico and other 3rd world vacation spots after Hawaii!! The weather is 80-87 degrees ALL year and the water is clean and WARM! (75-83 degrees) You will feel the ALOHA spirit!! The Whaler is right on the ocean and the back of the complex is on the Kaanapali golf course. It does not get any better than that. Right next door is Whalers village with shopping, bars and restaurants. The Sheraton is 2 properties door away with GREAT snorkeling at the famous Black Rock. Whale season is the end of November to the beginning of April and that is something special to view. Underground parking out of the sun!! Loved the property, loved the room, recently updated, would definitely request this room again on my next stay. So glad you had a wonderful vacation! We enjoyed our stay in this unit. Loved the downstairs walk out. The unit is great and we would stay there again. Best location, highly recommend & will return! Owner Cindy was attentive & available, great location. 1 week wasn't enough for my husband, myself and our 12 year old son. Easy walking distance to shopping, cafes, ice cream, fast food and fine dining restaurants & snorkelling. Right on the beach, big pool, hot tub, ground floor suite, fast laundry machines on every floor of the building, complimentary coffee every morning at the front desk, koi fish feeding at 8:30 am everyday, tennis courts & complimentary tennis equipment, underground or surface parking available, beach chairs, umbrellas, snorkel gear, boogie board, pool noodles all in the suite. Clean, beautiful condo. Comfortable Murphy bed. Will return! So glad you enjoyed your stay in Whaler 119. Hope you have a great holiday season and a great 2019! Wonderful property right on the ocean. Everything was as expected. We have stayed at this property before. Thanks again and a great holiday season! Great location and great condo! We just returned from a lovely week staying in this condo. The location is perfect- the Whaler is located in a great spot on Ka'anapali beach. It's walking distance to restaurants, bars, and is right on the the beach! We enjoyed the easy walk to Black Rock for snorkeling. We also enjoyed walking along the paved beach path that takes you by other resorts on the beach and the Whaler shopping center. The resort is very clean and the staff was friendly. This particular condo is also in a great location on the ground floor with quick and easy access to the pool and beach right from the patio. Everything in the condo was sparkling clean and in good repair. The kitchen had everything we needed to cook some meals. Our two teeanaged daughters said the queen murphy bed was very comfortable. It was also very easy to put up and take down every day. Cindy was great to deal with- offering good advice. The condo comes with 4 beach chairs, and umbrella and a small cooler to take to the beach. We would definitely stay here again when in the area and would have no problem recommending it to others. Thank you Alison and family for being our guest. We love the location of the Whaler and our unit also. Hope I can help you in the future. Awesome stay with or without children! **Even without children, this unit is still awesome**We travelled with our 6 mo/old and initially chose this unit due to its close proximity to Whaler’s Village and that it was on ground floor. Our expectations were far exceeded when we realized that this unit/complex is not only awesome and convenient for travelling with kids, but would be just as great if traveling without. Living room is nicely separated from the bedroom with a hall and bathroom, making the bedroom noise cancelling from the living space. Due to the time change, baby went to bed ridiculously early and we were able to stay up without disturbing him. You are next to the elevators, so you can hear the mechanics, but it sounded like white noise and did not disturb a sleeping baby. What’s great about being so close to the elevators is that your car is right below you. Soooo convenient! They even provide little shopping carts that you can borrow to get your groceries up to your room. There is a free washer and dryer for the floor that is located right outside the room and the owner provides free laundry detergent. Whaler’s Village is a 3-minute stroller ride or 5-minute drunken hobble away. WV has plenty of delicious restaurants, happy hours and quick bites to satisfy the most particular eater. Many of the sailing trips launch from this same area, so you save on the hassle of trying to park in the tiny WV parking lot. Overall, the unit was comfortable and offered everything we needed. The first portion of our trip we stayed at a high-end timeshare resort and while it was great to get poolside service, it was just uncomfortable. Knowing that this owner has a second unit in the complex makes returning a definite. We plan on going back next year with family and friends. Thank you for the nice review! We had a remodel start right after you checked out. Look at the new pictures.